By the 1970s she had become internationally famed as a humanitarian and advocate for the poor and helpless, due in part to a documentary, and book, Something Beautiful for God by Malcolm Muggeridge. She won the Nobel Peace Prize in 1979 and India's highest civilian honour, the Bharat Ratna, in 1980 for her humanitarian work. 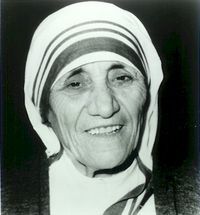 Mother Teresa's Missionaries of Charity continued to ex Blessed Teresa of Calcutta, or Mother Teresa, born Agnes Gonxha Bojaxhiu was an Albanian Roman Catholic nun who founded the Missionaries of Charity in Kolkata (Calcutta), India in 1950. For over forty years she ministered to the poor, sick, orphaned, and dying, while guiding the Missionaries of Charity's expansion, first throughout India and then in other countries.